New landfill regulations force counties to be more creative with their trash. Western states facing similar landfill crises. Bureau of Land Management changes open-arms policy for landfills. Review of two books on trash - The Garbage Primer: A Handbook for Citizens and Rubbish! The Archaeology of Garbage. Wanderings of an Environmental Journalist In Alaska and the American West. Essays by Philip Fradkin reviewed. High Altitude Revegetation workshop planned. 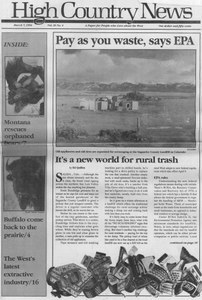 Computer bulletin board service focuses on rural West. The New Mexico Home Solar, A Source Book by Ingrid Kelley reviewed. Government study says nuclear cleanup workers' health and safety neglected. Colorado's Roxborough state park threatened by development. Waste from french fry production pollutes wells with nitrates, report says. Charting the Environmental Journalism Frontier conference planned. The 1994 Public Interest Science Conference planned. Commuting over McClure Pass, ad rates going up, Diane Sylvain art show. Politicians raise timber sale goals for political reasons, Idaho governor says. Trespassing charge is latest chapter in the Andy Kerr log-house controversy. Proposed Great Buffalo Herd Monument won't be built on Wyoming Bureau of Land Management Land. The Nature Conservancy creates Tallgrass Prairie Preserve where Park Service failed. Sen. Larry Craig organizes wise-use rally in Idaho. Ballot initiative would require that new mines be started only by companies with clean records. Greener Pastures Institute reports increased inquiries about moving to rural West. Crested Butte, Colorado, rancher says development is pushing him out. Mid-Continent Resources wants to develop land to help pay for mine cleanup. New plan for managing Northwest forests not much different than old. San Luis, Colorado, residents continue struggle to reclaim Taylor Ranch. Can San Luis resist 'regional chaos'? Maria Mondragon-Valdez worries Taylor Ranch will become "cultural Disneyland."